Two years ago, the San Francisco Giants won the World Series – a historic event – their very first World Series win in all 53 years they’d been the San Francisco Giants, after moving from New York (where they had won 5 World Series Titles between 1905 and 1954). 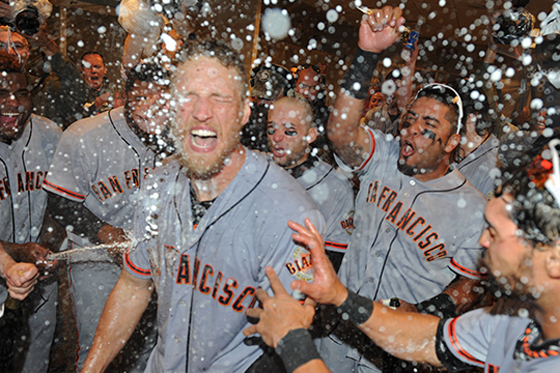 The 2010 team was something special, and we had our sights set for some more magic in 2011; but a devastating injury to Buster Posey and other challenges during the season took us out of a back-to-back championship run, although we did finish the season strong despite the all the adversity faced. This year, after working tirelessly to rehabilitate, Buster is BACK and especially after what we just witnessed this past week and tonight, I think this team has more magic in the tank. Game 3 was a nail-biter, with brilliant pitching from both teams dominating most of the action (or some might say “lack thereof”), but we avoided the sweep with a 2-1 victory in extra innings. Whew. In Game 4, we finally made a great offensive run, starting with Ángel Pagán‘s second-pitch home run in the very first inning, the first leadoff home run in Giants Playoff history. Our pitching struggled, and Timmy [Lincecum] made his second relief appearance in the post season. The entire team rallied, with everyone contributing, and for the second time, we escaped elimination with an 8-3 victory. Tonight, Matt Cain was again on the mound. He held the Reds scoreless for the first four innings – in fact, both teams posted 0’s – until Brandon Crawford tripled home Gregor Blanco. Then Ángel reached on an error by the Reds, and Craw scored the second run of the evening. But we weren’t done yet; Scutaro walked (the master! ), and then Pablo [Sandoval] singled to load the bases … and Buster sent them all home with a Grand Slam. The Reds battled back, but it wasn’t enough. Tonight, with a score of 6-4, The San Francisco Giants have defeated the Cincinnati Reds, sweeping them on their home field, and advance to the National League Championship Series. I don’t know about you, but I think these boys can go all the way. Let’s go, Giants!! !